Archelaos (or Archelaus) , son of Apollonius of Priene ( inscribed on a tablet in the upper part of the relief): The Apotheosis of Homer, since 1805 in British Museum (other sources say it was until 1819 in Palazzo Colonna ). 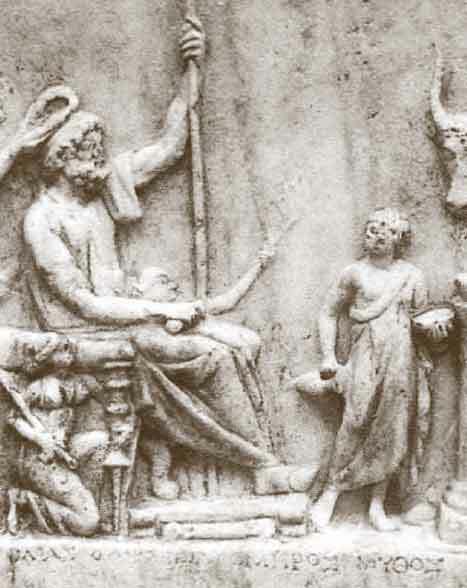 On epigraphic grounds, a dating of about 130–/20 BC is generally accepted, but other scholars maintain that the style of the drapery and the composition of some figures reflect tendencies which had already appeared in the years 225/200 BC. The relief was found in the first half of the 17th century in Italy, and since then has been the subject of much scholarly debate with regard to the iconographic identification of some of the figures, and its origin. Thus, on the one hand a possible connection with Alexandria has been rejected by Fraser, while on the other hand it has been maintained that ‘its subject matter is indisputably Alexandrian and suggests that it was made for a poet who had been victorious in some sort of poetic competition at Alexandria’. The sculpture has also been connected to Rhodes, on the basis of the assumed similarity to the renowned cycle of Apollo and the nine Muses by Philiskos of Rhodes, which is described by Pliny standing in Rome near the Porticus Octaviae. Nevertheless, though a sculptor named Philiskos of Rhodos is known to have worked in about 150 BC, a painter and a late 2nd century architect also bear the same name. In fact, we have no clear evidence that Pliny's description refers specifically to the famous master of the cycle of the Muses. 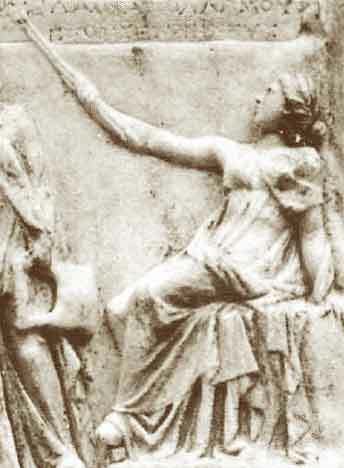 2) Mnemosyne, the Mother of the Muses, personified by a tall middle–aged woman, who stands in a dignified position with her right hand on her hip. 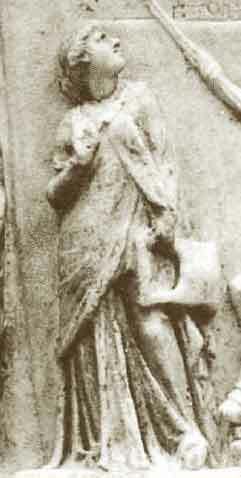 She wears a peplos and a mantle folded over her right shoulder, and her head is veiled. 3) Terpsichore (Delight of dancing/choruses) – dance. (Roman Sculpture) . 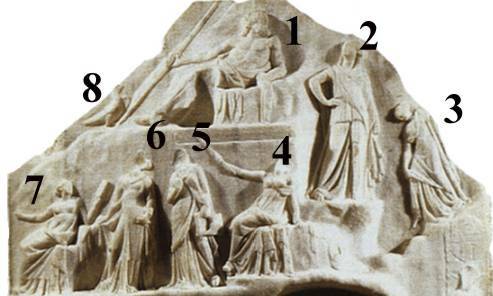 The dancing Muse, due to the fact that both Zeus and Mnemosyne are depicted on a larger scale than the other figures, the Muse that is seen on the right, descending the rocky staircase, seems small. With regard to the significance and identity of this latter figure, some scholars describe her movement as ‘running quickly down’ and identify her as Thalia, Muse of Comedy, or Calliope. A different interpretation is given by other researchers, who describe her as a Dancing Muse. She is in fact the only figure in the upper registers to be depicted in active motion rather than a static position as is the case with regard to the other eight Muses and Apollo. She is descending the mountain with a graceful and harmonic movement, her head inclined forwards as if watching her step, holding and lifting the end of her himation with her right hand. As a result of this gesture, her well–formed naked foot is disclosed and becomes the central focus of the whole composition. The Muse is represented in a rather complex motion, which relates to the continuance of her descent from the mountain, and to the very moment when she is about to set down her right foot on the rocky surface. Her step is wide with regard to its distance from the left foot, which is partly seen under the folds of the long chiton, a particularity which emphasizes the dynamics of the movement since she is depicted off balance, with the weight of the body being transferred forward and downward. Her drapery, which falls in soft folds behind her, emphasizes both the active movement and the charm and lightness of her figure. 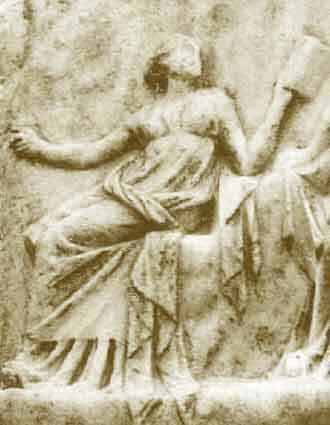 The association with Hesiod’s “Heliconian Muses” is inevitable, the more so since the whole depiction of the mountain with Zeus and Mnemosyne follows the Theogony very closely, and thus I consider the assumption that the Muse in question is indeed performing a dancing movement to be very convincing. This conclusion is further based on the dynamic and extremely graceful quality of the movement, which differs considerably from the rather stiff and frozen postures and gestures of the remaining figures on the relief. 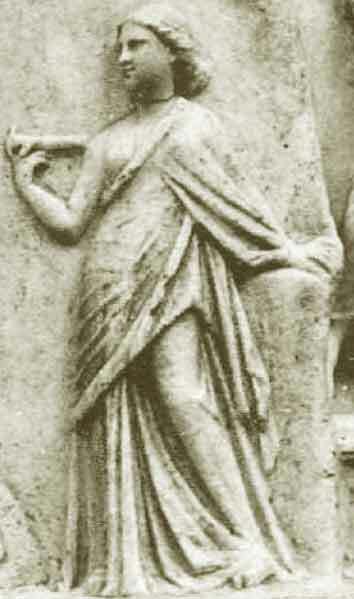 From a stylistic point of view, both the Dancing Muse and the other Muses depicted on the relief of Archelaos are considered to be variants of earlier works of art that have not been preserved, and may be reflected in later replicas. 4) Euterpe (Delight) – music. 7) Clio (kleos(glory) / kleiein (to celebrate) / Celebration/Fame) – history. The lower scene presents no problems of identification, since the names of all the participating person (15 figures) are inscribed immediately after them. It takes place in a sanctuary, which is suggested by a row of eight high Doric columns concealed by a long, wide curtain, which covers the background. 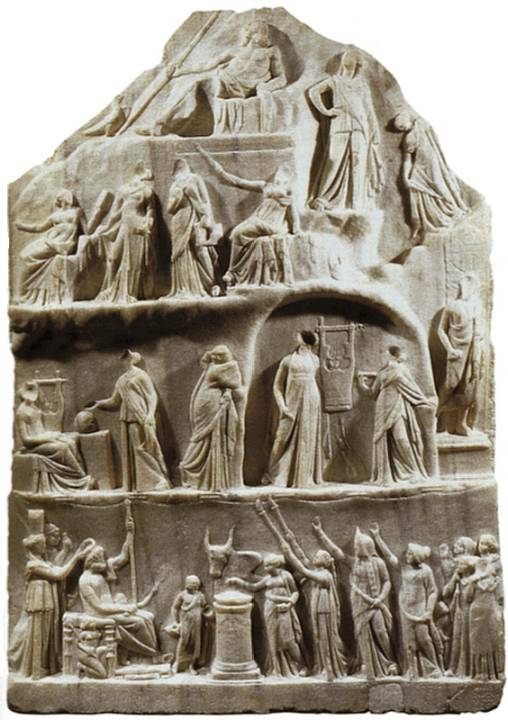 15–-25) a crowded group of participants in the procession, who appear as personifications of History, Poetry, Tragedy and Comedy, Physis, Arete, Mneme, Pistis and Sophia. 25) the young boy is Mythos (Myth) and the girl 23) History. One source considers the persons behind History (23) moving to the right as tragedy, comedy, nature, integrity, memory, fidelity, and wisdom although 2 persons are then without identification. 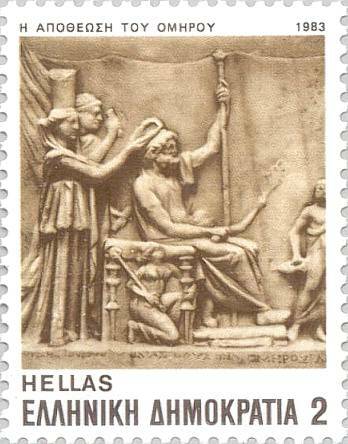 27) Homer enthroned – a bearded and venerable old man – holding a scroll in his right hand and a scepter in his left together with 26, 28) The Iliad and the Odyssey. 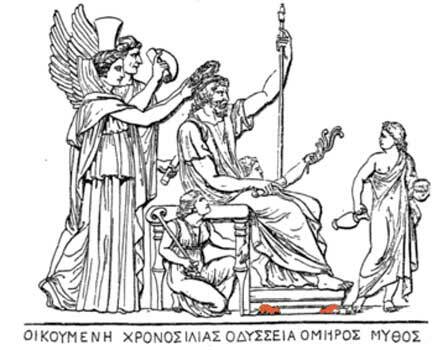 Homer's throne is supported by two female kneeling figures, which personify his main creations: An allusion to a further poem, the Batcho–myo–machia (Battle of Frogs and Mice) can be found in the mouse depicted on the footstool under the throne. 29, 30) Behind Homer two tall figures are crowning him with a wreath. The inscription identifies them as Chronos (Time) and Oikumene (World) but some scholars believe that they portray Ptolemy IV Philopator and his sister–wife Arsinoe III.